Commencement at Elon is full of long-standing traditions. Over the next few weeks, we’ll highlight a few of these traditions, starting with the Elon mace. Have you ever witnessed Dr. Earl Danieley carrying a large silver item at university events such as Convocation and Commencement? Indeed, Dr. Danieley along with numerous faculty members have shared the privilege of carrying the Elon mace during campus events. 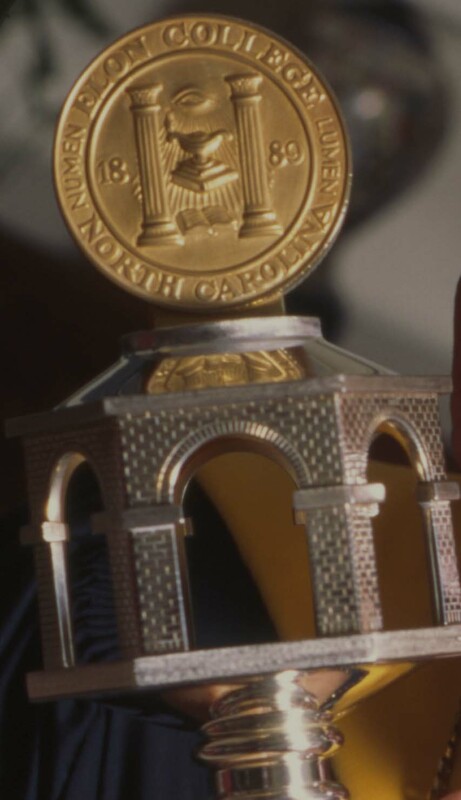 Elon’s official mace was unveiled for the first time during the Centennial Convocation on April 25, 1989. It was a gift from the estate of E.M. Martin in memory of a well-known and loved Elon professor, Dr. Alonzo Lohr Hook (Class of 1913). Dr. Danieley had the honor of being the first faculty member to carry the mace, and he led the academic procession for the Convocation. 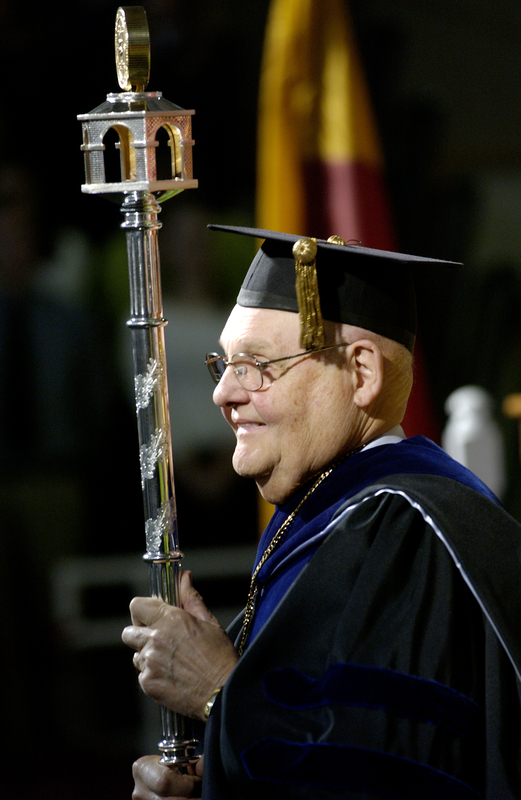 On May 18, 1996, Dr. Danieley carried the mace once again during the Commencement procession. Additionally, he was recognized for fifty years of service to Elon, and the ‘J. Earl Danieley Distinguished Professorship’ was established in his honor. 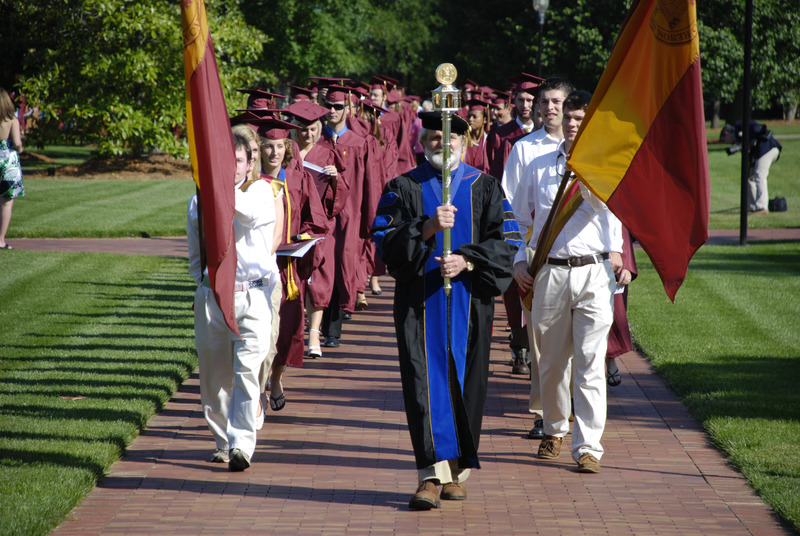 The tradition continues today, when Dr. Danieley or a senior faculty member is chosen to lead the Convocation and Commencement academic processions carrying the sacred Elon mace. The mace is handcrafted and made of sterling silver that is about forty inches long and weighs about twelve pounds. It was produced in Portugal and designed by Gayle Fishel (Class of 1978). The design includes the college seal (in gold) that tops a five-sided replica of the brick colonnades on campus, with open arches and chasing to represent the brickwork. The colonnades represent strength and stability, as well as the five parts of a liberal arts eduction. The shaft of the mace includes four distinct parts that represent four years of study. Silver bands alternating with oak leaf and bright silver bands run along the entire shaft. At the end of the shaft, is a gold acorn that represents the seed of learning. This entry was posted in Academics, Campus traditions, Faculty and Staff. Bookmark the permalink.